← 474 "Moms I'd Like to Forget"
For the drink from the episode Flaming Moe's, see Flaming Homer. "If only this town had a men's bar for the average-looking fellow." The Simpsons are scoops of ice cream served as a sundae. Hot fudge, whipped cream and a cherry are added and Santa's Little Helper eagerly devours them. Mr. Burns flies by in a vintage airplane. Smithers clings to the tail. "Flaming Moe" is the eleventh episode of season 22. 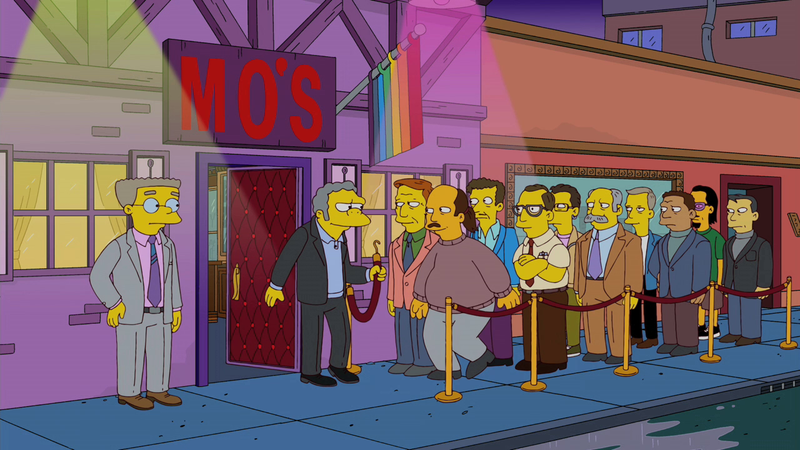 "Moe and Smithers turn Moe's into "Mo's", a gay bar. Meanwhile, Principal Skinner uses Bart to get closer to dating a substitute music teacher after finding out that he is dating her daughter." After a fight between the day and late shifts of the Springfield Nuclear Power Plant, initiated by Homer after the late shift worker stole his candy, Smithers goes to Mr. Burns' office and sees him signing his will. Smithers gets a look at the will later that night and discovers that he isn't included in it. When Smithers confronts Burns about being excluded, Burns tells him he only respects "self-made men". An upset Smithers tries to cheer himself up by going to a gay bar called "The League of Extra-Horny Gentlemen" but is denied entrance because he isn't attractive like the rest of the men in the bar. Instead, he stops by Moe's Tavern and notices how slow business is. As Moe serves him a drink, Smithers laments that Springfield needs a bar for the average-looking gay man. Then an idea dawns on Smithers, and he proposes to Moe that they refurbish the bar and make it into a more accepting gay bar. By doing so, he hopes to earn Mr. Burns' respect by building a successful business in addition to having a place to feel accepted. Moe is first reluctant about the idea, because he doesn't feel like being around so many gays, but he soon realizes that with Smithers' plan he can make money. Moe thus decides to turn Moe's into an ultra-trendy gay bar, renaming it to change the name to "Mo's". Smithers revisits the sidewalk in front of The League of Extra-Horny Gentlemen and tells the gays who were denied entrance (among them Grady and Mr. Largo) that they will be welcome in Mo's. Grady and Largo come to Mo's and have a good time, and as word of Mo's spreads in the gay community, Mo's soon becomes a success amongst gays. However, longtime Moe's regulars Homer, Lenny and Carl don't like the idea too much. Meanwhile, Mr. Largo runs away with his new boyfriend, and a new substitute music teacher, Ms. Juniper, is hired at Springfield Elementary School. Juniper takes her class to a field trip to sing near the mountains. Skinner soon arrives to inform Juniper she has the wrong permission cards and is so strongly moved by her singing that he faints. When he wakes up, he quickly sees how pretty she is and tries to date her. To make her happy, he tells Bart to date her daughter, Melody. 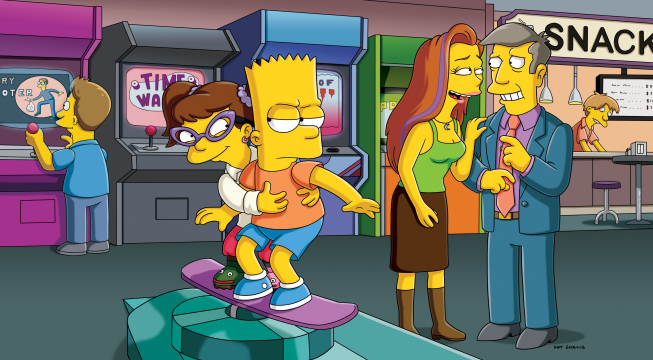 At an arcade, Bart and Melody play together, but Bart isn't interested in her. However, Juniper is interested in Skinner and they start to dance. At Mo's, the gays enjoy the bar and have a good time dancing there, but they think Moe is gay too. Smithers then starts to think Moe is going too far with giving himself a gay image. The gays even invite Moe to a gay parade. However, Moe doesn't want to admit he isn't gay, because his gay customers' believing he is gay is the main reason Mo's is a success. 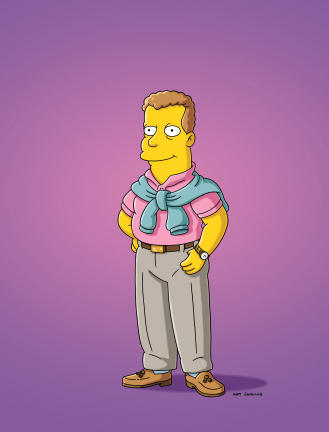 Moe then goes on to become even more popular than Smithers, so popular with the local gay community that they push Moe to run for the city council to become the first "openly gay" council member. Meanwhile, Bart tells Melody he doesn't like her, and Melody thinks he is breaking up with her. She is so sad that Ms. Juniper wants to leave town, but offers to let Skinner come along with her. He accepts, and Groundskeeper Willie is appointed the new principal. Smithers then attempts to "out" Moe as straight while Moe is announcing his candidacy for the city council. At the Springfield Town Hall, Moe promotes his candidacy with gays, who love him and think he is perfect to be a council member. However, Smithers demands that Moe kiss him as proof that he is really gay. Puckering his lips, Moe leans into Smithers, but at the last minute cannot and confesses that he was lying about being gay. The crowd don't know whether to vote for the man who lied, or for another candidate who is secretly gay. They soon get upset and leave. Before Moe leaves, he grabs Smithers and kisses him, afterwards saying, "Like Frisbee Golf, I'm glad I tried it once." Moe's Tavern is then changed back to its old appearance. Three months later, Skinner comes back from having run away with Ms. Juniper, thinking he has only been gone for one day. The episode was written by Matt Selman and directed by Chuck Sheetz. It guest stars Kristen Wiig, Alyson Hannigan and Scott Thompson. The episode was viewed by 6.47 million household - a low rating for the show but this was due to an NFL overrun. The episode has received a positive response from TV critics. The A.V Club called it a "strong episode" and went on to say "this was a very good episode of The Simpsons. The guest stars added instead of subtracting, it had a gently satirical inverse of gay panic jokes, and it was pretty damn funny." 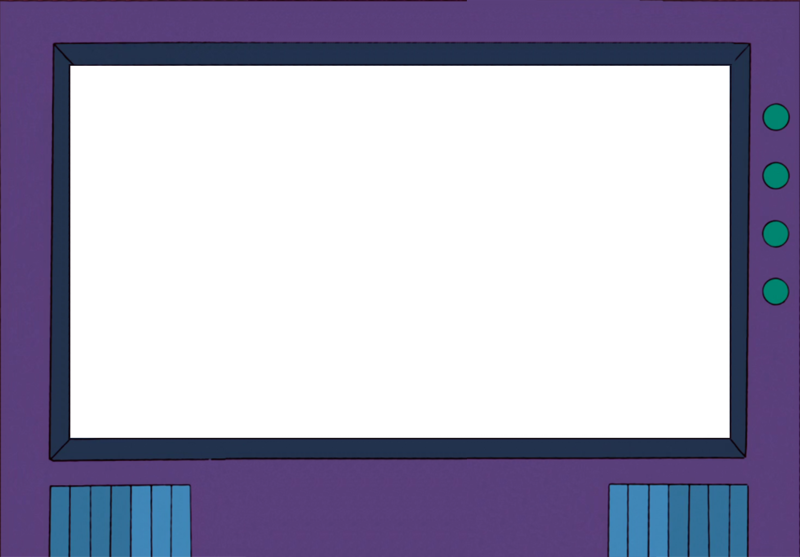 It was given a B+ rating, the highest rating of the night, beating Bob's Burgers, American Dad, Family Guy and The Cleveland Show. Modified on January 23, 2017, at 19:43.